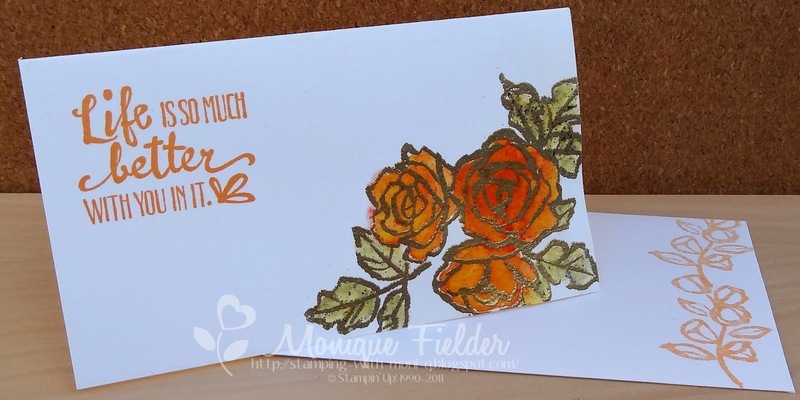 Stamping With MoniQ: ESAD Blog Hop - 2018 Occasion to Sale-A-Brate! 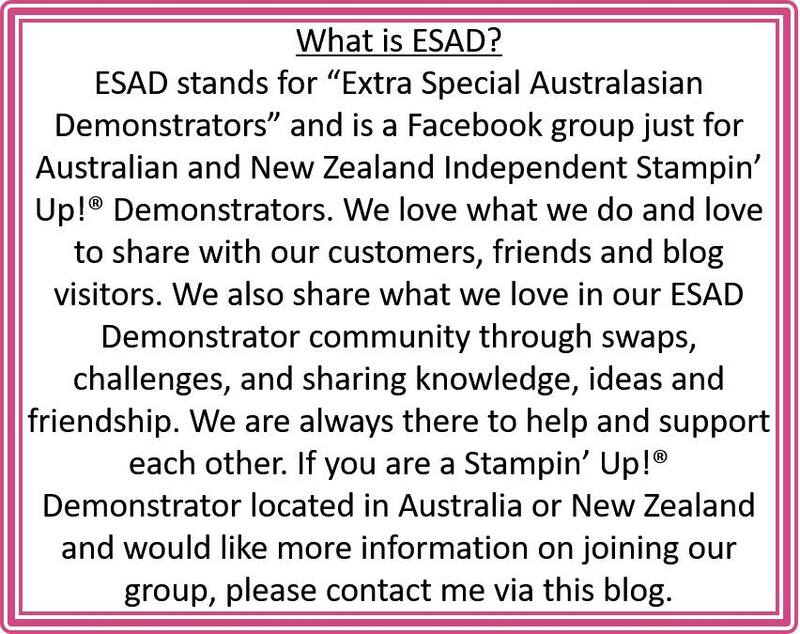 ESAD Blog Hop - 2018 Occasion to Sale-A-Brate! 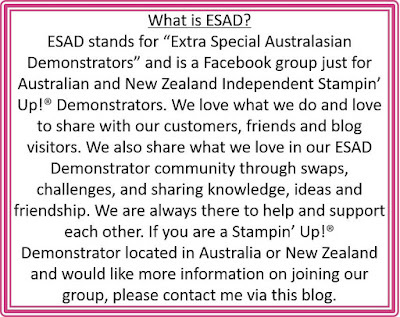 Welcome to another ESAD Blog Hop, our first for 2018! 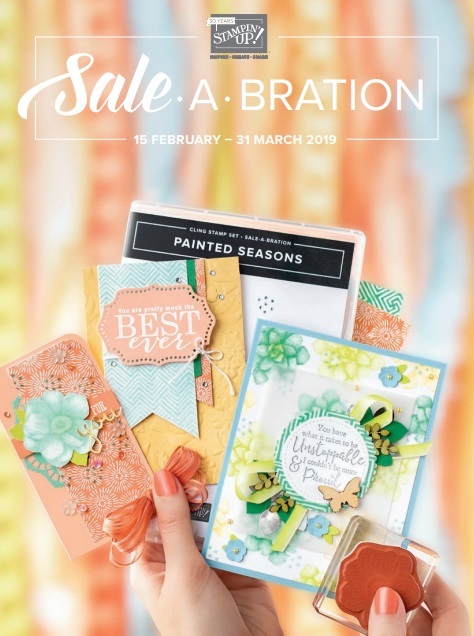 For this hop we are showcasing some of the amazing products in the Occasions and Sale-A-Bration catalogues, and what a great range of products there are, so I am very excited to see what my fellow demonstrators have created. So grab a cuppa, sit back and hop your way around from blog to blog, following the link at the bottom of each post. 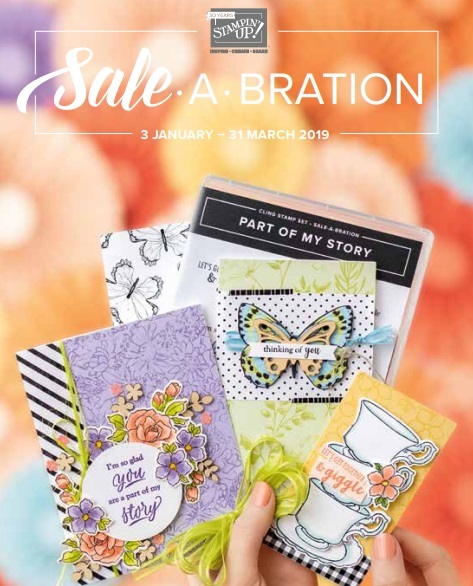 I wanted to showcase a few of the new products in my project for you from both the Occasions and Sale-A-Bration (SAB) catalogues, and thought a gift bag and matching card would be the perfect way to show a number of them. I have used eight products from the new catalogues, can you spot them? Here is just the bag which I made from a sheet of the gorgeous Petal Passion DSP, I made the bag up prior to colouring it, but then decided it could do with a bit of colour. My solution ... Brusho! I spritzed each side of the bag with water then sprinkled on the Gamboge (orange) Brusho crystals and let them go where they wanted. It was a bit messy and I would highly recommend that if you want to use Brusho on DSP, you do so before making your bag! Once it had chance to dry out in the sun for a little while it turned out beautifully. I love the speckled colour that is achieved with this product. The tag was made with a stamp and flower framelit from the Petal Palette Bundle and one of the framelits from the level 2 SAB Celebrate You Thinlits. 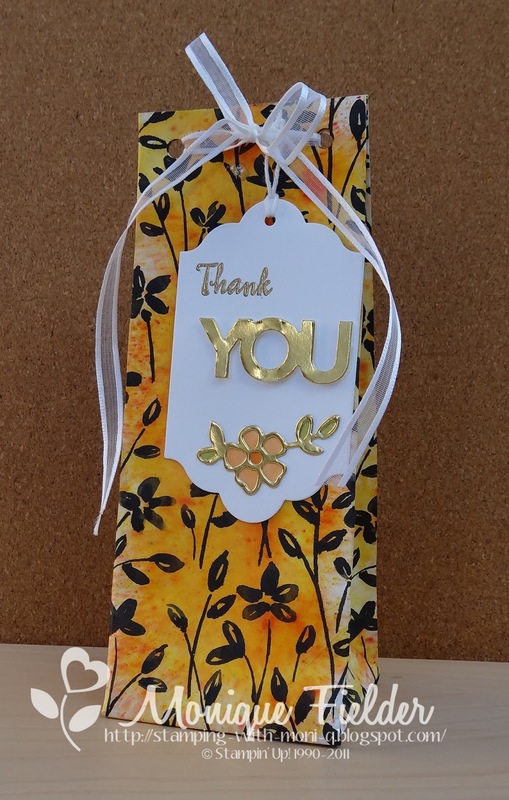 The gift card was made using one of the cute little Whisper White Narrow Note Cards & Envelopes from the Occasions Catalogue (bottom of page 18). The flowers from Petal Palette were stamped and Gold Embossed then I used Brusho to colour them in, this was one of my first plays with Brusho and I fell in love! Some of the colour leaked slightly outside the lines but I think this adds to the overall look of the card. 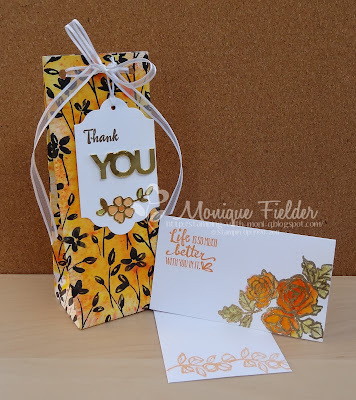 I think the sentiment is so beautiful with it's mixed fonts and little squiggle at the end! The envelope was stamped with another stamp from the same set which I stamped off to give a softer look. Time to hop on over and see what my good friend Cathy has created. Nice projects Monique. Love the brightness of the pumpkin pie blends. These projects are gorgeous Monique! I was surprised to hear how you coloured the bag but it sure is sensational. Such a bright yellow. Beautiful gift bag and note card Monique. I love the Brusho on the DSP bag, I may have to CASE that idea!!! Your projects turned out lovely but they are so much nicer in person. Thanks for the playdate. Wow Monique. These projects are all so striking. I love the colours with the gold. Such great impact!